Ever want to see how an Ipad is made? This article includes a video, filmed by Rob Schmitz, a public radio journalist. Rob was the journalist who exposed the working conditions at the Chinese electronics factory. Rob is now the second Western journalist to visit the factory floor, since Mike Daisey‘s falsified report about the harsh working conditions in Foxconn factories. 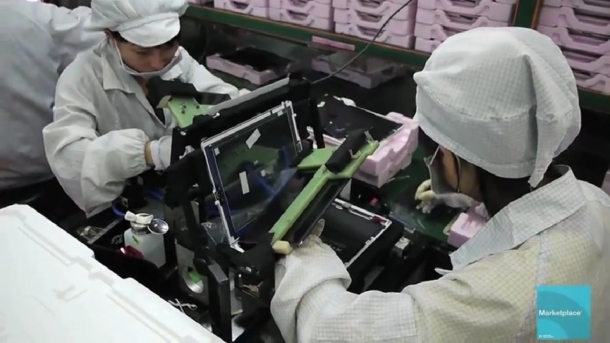 (See post about Foxconn working conditions) The video was taken by a hired film crew in Foxconn’s Longhua facility in the city of Shenzhen, the official birthplace of Ipads. Rob’s video features the construction of the Ipad’s motherboard, and touchscreen, as well as some tests. The video also included a line up of people, wanting to work in the Fosconn factory for a starting $14 a day. Anyways, if you want to see an Ipad being made, then go right ahead and click the link above. This link will bring you readers to an article I found about apple. 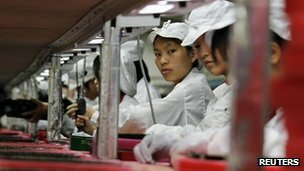 Apparently the Japanese workers for Foxconn, the multinational electronics manufacturing company for Apple, have terrible working conditions. Some significant issues was long working hours and poor saftey. Many of the workers at Foxconn were seen working more than 60 hours a week, sometimes for 7 days staight, without their needed day off. Also Foxconn workers are not payed enough for their overtime hours and there factorys are filled with health and saftey risks. At least the FLA said that they have secured agreements to improve these issues. This article is not very interesting just so you guys know but anybody who is interested in the Apple company, then this article clearly describes Apples discovered problems. Apple is in deep S!% now!